Last Christmas, after the delicious meal at my Grandma's house with all of the extended Sonier Family... I spent a little time relaxing and spinning on my Gripping Yarn Russian Spindle. Several of my Uncles are woodworkers, but one of my uncles in particular, Tim, works on a lathe and does beautiful wood-turning! He examined my spindle, and thought that he might be able to make another for me from his own materials. Well, these are what he came up with! (Recognize my Walnut Russian in the top left?) I love the uniqueness and character of both! Uncle Tim isn't a spinner, but he is definitely a creative woodworker. 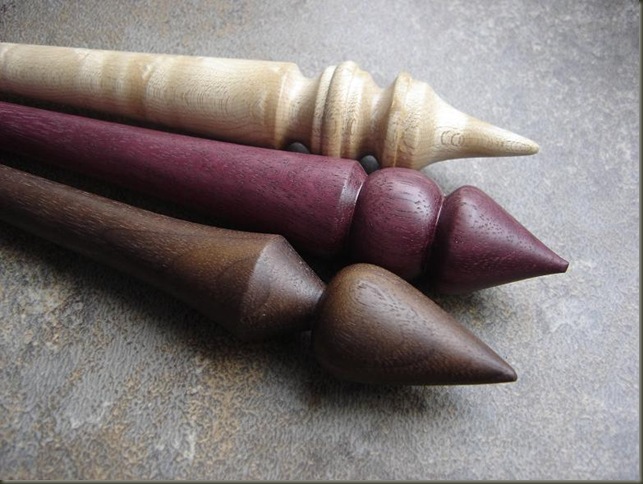 He chose some unique woods, and came up with some unique decorative designs for the spindle tips. 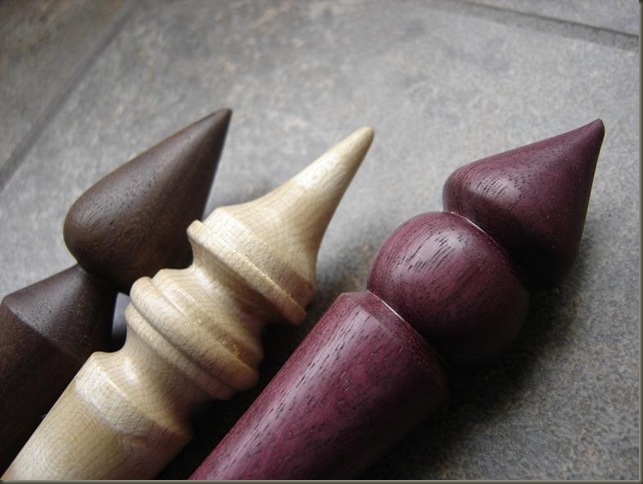 Both spindles are nicely finished with tung oil to a semi-glossy satin smooth finish. The Blonde Spindle is made from some sort of Maple (I can't remember if it's spalted or bird's eye) and features some fancy scrollwork instead of a traditional bulb shape. I haven't weighed her yet, but it feels like it weighs about the same as the 30g walnut does. I tried just a quick spin with a lock or two of angora, but she seems to spin nicely. The Purple Spindle is made from rich dark Purple Heart - and is quite heavy! It likely weighs as much as both of the other two put together! I think it will make a great plying spindle, because of the weight. I have to sand down the tip of this one again, since it got dropped and the very end broke off.... but I think it will spin much better once that part is fixed. My plan is to get some very fine sandpaper sometime this week and hopefully fix that tip, and then do some sample spinning and have some fun playing with my new toys! 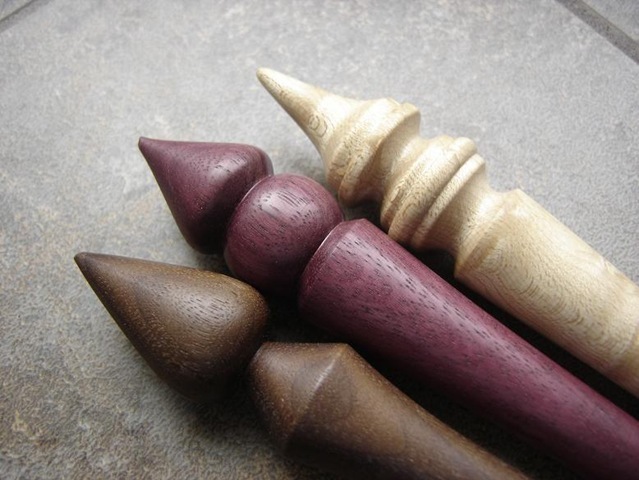 It's getting warmer here now that spring has semi-arrived... perfect weather for sitting cross-legged out on the patio with a supported spindle! On my last trip up to Belfast Mini Mills... I saw these fabulous wooden knitting needles! The company is Woody Knitters, and the needles are handmade here on PEI. 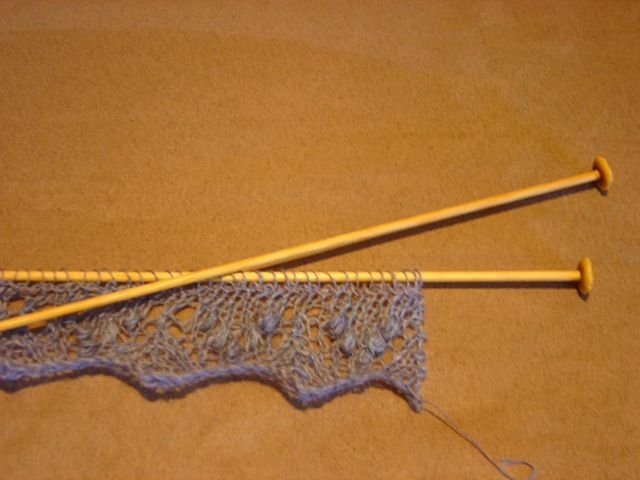 I had been wanting some smaller (both in diameter and in length) wooden needles, as I have read that they are excellent for lace knitting. The wood is smooth, but grips the lace thread so nicely. Also, the needles are so feather light, and very warm in your hands. I have tried bamboo dpns before, and they were ok... I didn't appreciate the bendy feeling of working with them. I tried a pair of ebony wood Lantern Moon needles also, but for socks, they just didn't work for me. I broke 2 of the set before I finished an entire sock. They looked lovely, but didn't hold up to my rough travel-knitting needs. - Sharpness: The tips are just the right level of pointy. 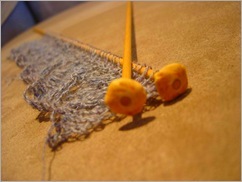 For fine lace work with even finer thread yarns, a fairly pointy tip is required for manipulating the stitches properly. I've done various stitches, including K3tog in Orenburg-style stitches, and Nupp stitches in Estonian style samples. - Flexibility: For lace knitting (where presumably the knitting stays put, in one location from start to finish, unlike socks, that travel in various states of completion for a month in purses and bags for on-location knitting) a little bit of flexibility is okay! 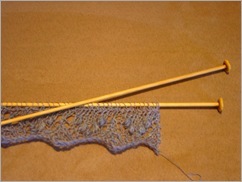 The bendy nature that I hated in sock needles, was not a problem in lace knitting. 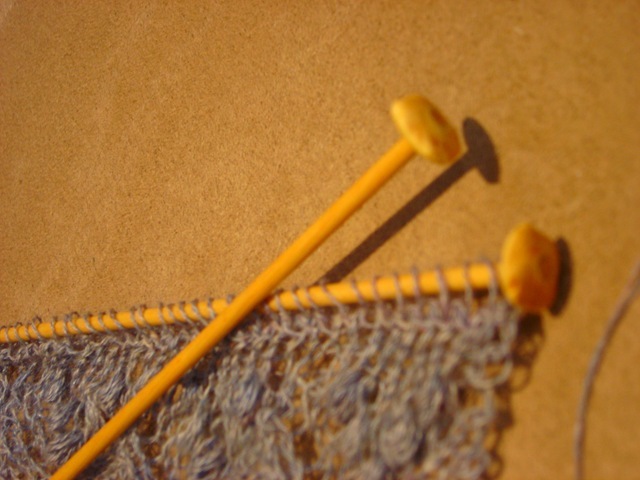 Where you are only knitting back and forth, and not in the round with all of it's requisite twisting and manipulation, that slight "give" makes the process less rigid and actually more enjoyable! - Weight: Compared to the steel needles I had been using... these needles feel like they hardly weigh anything! I used to find that holding up the heavier needles, at sometimes uncomfortable angles, to try and create more complex stitch patterns - that I would get sore shoulders, or tired arms. Not so with the wooden ones. The length might also have something to do with that though... The size and weight are just more comfortable for some reason. All in all, the best 14 bucks I've spent in a long time! If you would like more information about this brand of needles, please let me know... I don't think they have a website, but I do have an email address to share if anyone would like to contact the maker! 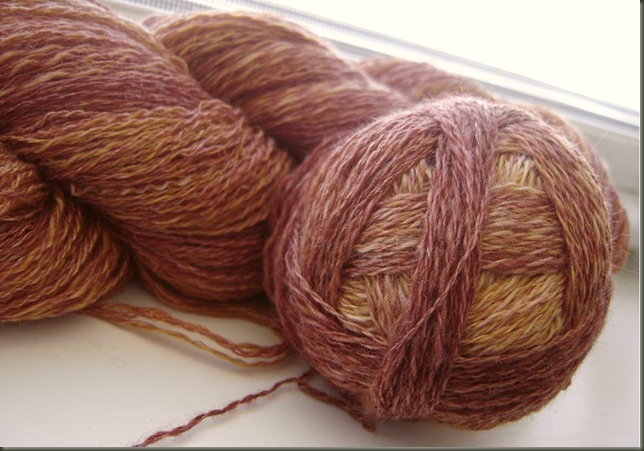 The Persimmon Seasilk yarn is completed.... washed, balled, and ready to go now. I love the oranges and reds that came out of it. 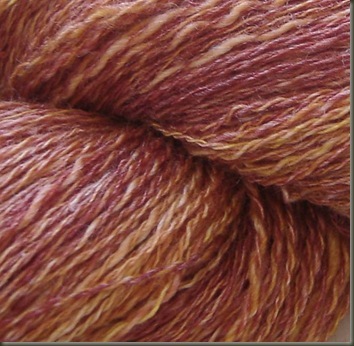 The fiber was a braid of Waterloo Wools - Seasilk / Merino Blend, in many shades of orange and red... colors that I love, but don't tend to gravitate towards in the same ways as my earth tones of blue, green, and brown. The fiber itself was a delight to spin, and was fun as a travel spinning project. I used my Golding Dragonfly spindle, spun from the fold one little tuft at a time from one end of the braid to the other, most of the work done on my lunch breaks or coffee breaks. A few minutes here and there really adds up! I didn't measure the entiretly of the yardage, but am estimating that I have around 700 yards of medium Laceweight, with some slightly fluctuating thick and thin spots. This is destined to become a semicircular shawl - Vernal Equinox! I've cast on, but only just barely. I can't wait to see how this will stripe up and see how the colors will arrange themselves!